Ooligan Press, 2012, 305 pp. In this debut novel, fifteen-year-old Miriam Josefsohn grapples with suffrage, her brother’s death, a traditional father, and a family heirloom with special powers in 1912 Portland, Oregon. Well researched — A seasoned nonfiction writer, Feldman knows her way around archives. Her meticulous research serves her well. Fantastical elements — I was intrigued by Serakh and all she represented. I liked the time travel and found more energy in those sequences than in the “current” story. Reconnection to Judaism — As assimilated Jews, members of the Julius Josefsohn family do not observe many traditions or practices. Serakh and the prayer shawl’s blue thread provide the reconnection for Miriam. Typography focus – Feldman did an outstanding job here of incorporating typography as a frame of reference for Miriam’s thoughts and of including the technical aspects without detracting from the overall story. Ambition — Miriam has ambition despite her circumstances. In the same vein, Feldman’s first novel is also ambitious. Author’s Note — In this note, Feldman describes the catalysts for her novel. Back in time — I have nothing against time travel, but I often got lost in the logistics once Miriam and Serakh went back to biblical time. Kitchen sink syndrome — There was a lot here. Death in the family. Relationship issues with parents. Conflict on broader scale with women’s right to vote. Endowed object with time travel. Conflict in biblical times exacerbated by the heroine. Perhaps too much going on at the expense of deeper characterization. This entry was posted in Book Reviews and tagged Blue Thread, Ooligan Press, Ruth Tenzer Feldman. Bookmark the permalink. 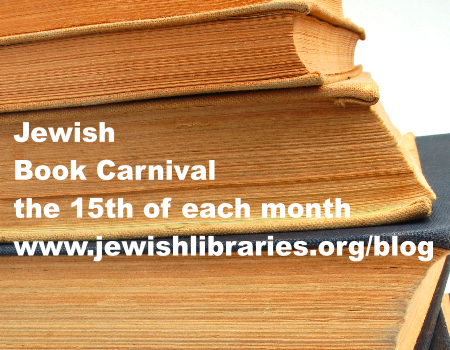 Curious about the publisher: new, distributor for self-published books, books of Jewish interest, location ? Curious about the author: other books, agent? This sounds like a very interesting book, I really liked the review, very informative. I usually get my reviews from The Book Report (I love the show), but I very much enjoyed reading this review. Thanks, Magda – glad you like The Whole Megillah reviews! Thanks for the review! Ruth Tenzer Feldman will be contributing a post to our Kidlit celebrates Women’s History Month blog, which will start its second annual round of posts on March 1 at kidlitwhm.blogspot.com. Indeed! 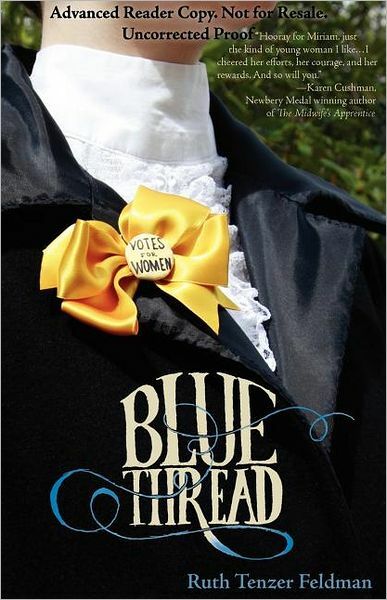 Blue Thread is rich in history about woman suffrage. I’m delighted to be part of the Kidlit celebration (my post is on March 24), and even more delighted that there is such a round of posts. Thank you, Fourth Musketeer and Shelf-Employed.